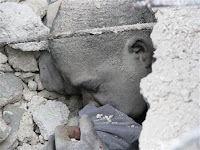 The Haitian Blogger: School Collapses as Haiti's UN Jailers Spend $1.64 Million PER DAY on "Stabilization"
School Collapses as Haiti's UN Jailers Spend $1.64 Million PER DAY on "Stabilization"
The head of a male student, still alive, trapped under the debris is pictured at the scene of the church school that collapsed on the outskirts of Haiti's capital Port-au-Prince, November 7, 2008. My birthplace is Petion-Ville, Haiti. It is a suburb of the capital of Haiti, Port-Au-Prince. 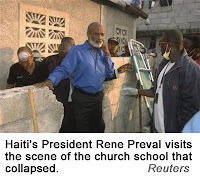 A school named "La Promesse" (the promise) in Petion-Ville collapsed yesterday at mid-morning. The whole three story structure just crumbled. The concrete fell on the approximately 500-700 children from kindergarten to high school attending the school on Friday. At least 50 are dead. At this time Haitians are digging with their bare hands and working through the night to pull out the hundreds that remain trapped under the rubble. That's $50.13 million per month, $1.64 million PER DAY. Yesterday, if Haiti had more bulldozers, more children would have been rescued. With the UN occupying force there, Haiti is turning into a penal colony. There were approximately 3000 people in jails in Haiti before the occupation. At this time the UN is saying that there are 8000 people incarcerated in jails throughout Haiti. Many have not received due process. They have been held in jails for many months without so much as a hearing. The UN is building jails to house children now. Children from six years and up are being incarcerated. MINUSTAH refuses to provide Haiti with long-term and necessary development assistance. MINUSTAH is not building any schools in Haiti. If not to protect and secure Haiti for Haitians, why is MINUSTAH in Haiti? In February 2004 when the coup d'etat took place, Guy Phillipe (a CIA asset) crossed into Haiti from the Dominican Republic. He started taking the Northern towns including Gonaive and Cap Haitian. Along the way he killed the policemen guarding jails and released the prisoners to join his merry band. His caravan of murderers grew in size as he went. But Guy Phillipe dared not enter Port-au-Prince, because the people put their bodies on the line. They barricaded Port-Au-Prince and let it be known that they would die defending their president. Since their proxy rebels, led by Guy Phillipe could not get the job done, the US sent what they said were 50 soldiers to protect their embassy. Under this pretext they entered Haiti's capital with numbers of soldiers, including French soldiers. On February 29, 2004 the US took President Aristide on a plane out of Haiti, under threat of violence, to a former French colony, the Central African Republic.